Hall A collaboration meeting, June 23-24, 2005, 1 Operated by the Southeastern Universities Research Association for the U.S. Department Of Energy Thomas. 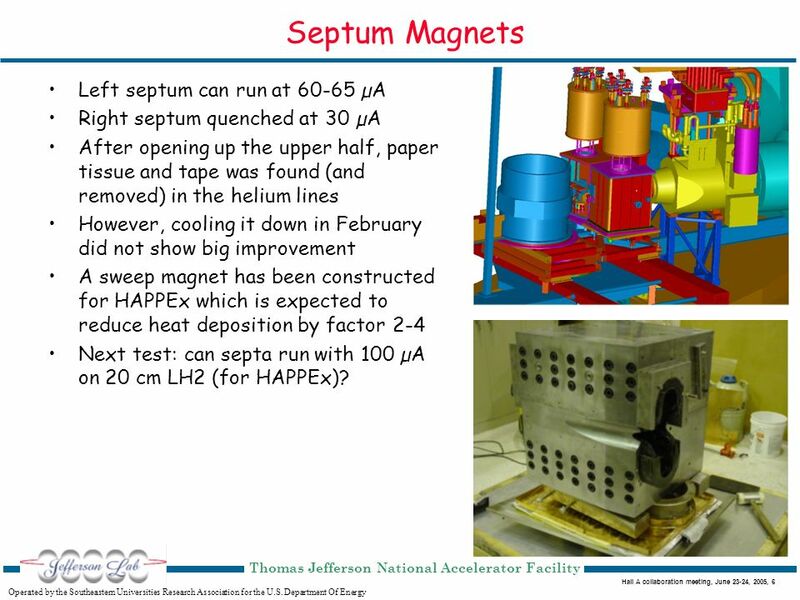 6 Hall A collaboration meeting, June 23-24, 2005, 6 Operated by the Southeastern Universities Research Association for the U.S. Department Of Energy Thomas Jefferson National Accelerator Facility Septum Magnets Left septum can run at 60-65 µA Right septum quenched at 30 µA After opening up the upper half, paper tissue and tape was found (and removed) in the helium lines However, cooling it down in February did not show big improvement A sweep magnet has been constructed for HAPPEx which is expected to reduce heat deposition by factor 2-4 Next test: can septa run with 100 µA on 20 cm LH2 (for HAPPEx)? 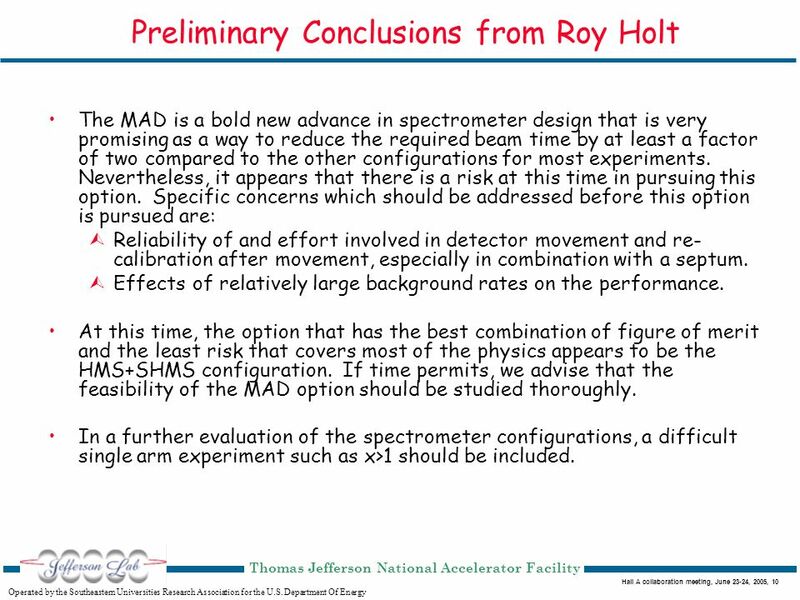 10 Hall A collaboration meeting, June 23-24, 2005, 10 Operated by the Southeastern Universities Research Association for the U.S. Department Of Energy Thomas Jefferson National Accelerator Facility Preliminary Conclusions from Roy Holt The MAD is a bold new advance in spectrometer design that is very promising as a way to reduce the required beam time by at least a factor of two compared to the other configurations for most experiments. Nevertheless, it appears that there is a risk at this time in pursuing this option. Specific concerns which should be addressed before this option is pursued are: Reliability of and effort involved in detector movement and re- calibration after movement, especially in combination with a septum. Effects of relatively large background rates on the performance. 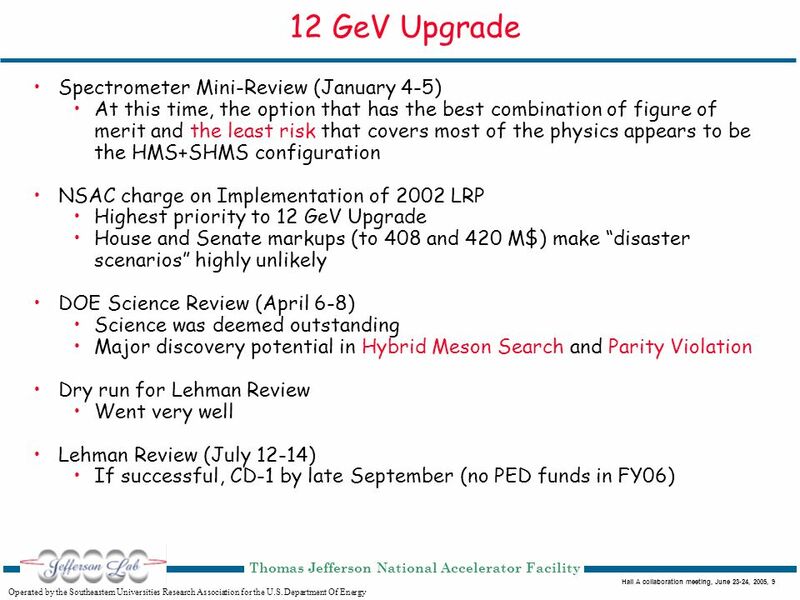 At this time, the option that has the best combination of figure of merit and the least risk that covers most of the physics appears to be the HMS+SHMS configuration. If time permits, we advise that the feasibility of the MAD option should be studied thoroughly. In a further evaluation of the spectrometer configurations, a difficult single arm experiment such as x>1 should be included. 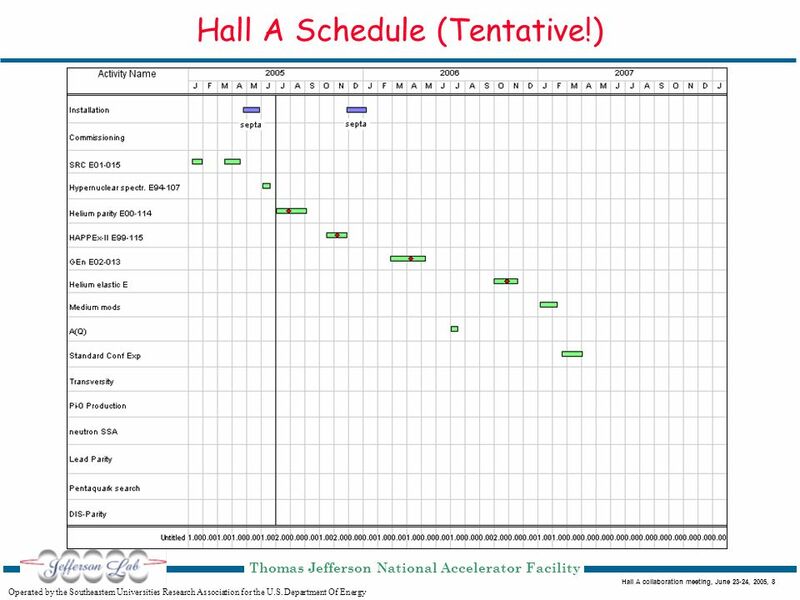 12 Hall A collaboration meeting, June 23-24, 2005, 12 Operated by the Southeastern Universities Research Association for the U.S. Department Of Energy Thomas Jefferson National Accelerator Facility Summary Hall A research program vibrant Many exciting new results Good progress on archival publications Septum magnets are (finally!) operational Scheduling for next five years will be difficult 12 GeV project is gaining momentum and broad recognition ¤Keep up the good work! 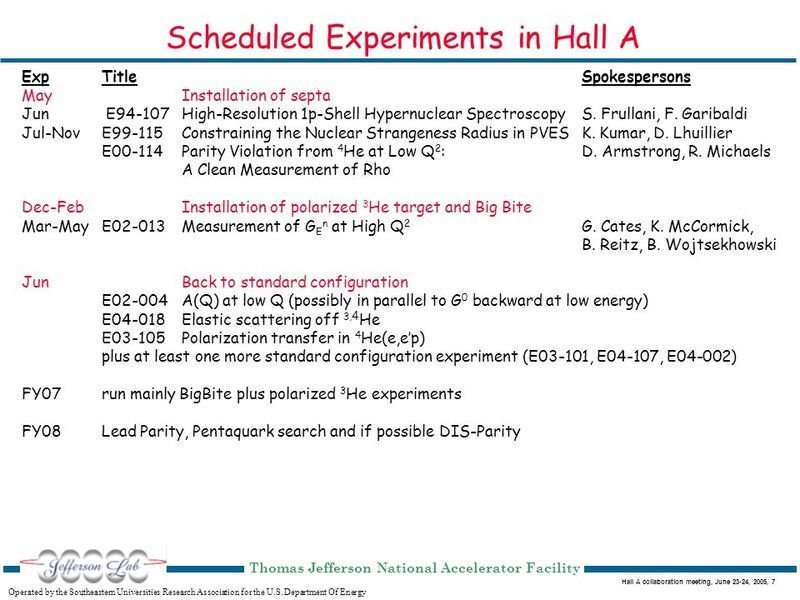 Download ppt "Hall A collaboration meeting, June 23-24, 2005, 1 Operated by the Southeastern Universities Research Association for the U.S. Department Of Energy Thomas." Kerstin Sonnabend, IKP, TU Darmstadt S-DALINAC - Nuclear Astrophysics Nuclear Astrophysics at the Darmstadt superconducting electron linear accelerator. 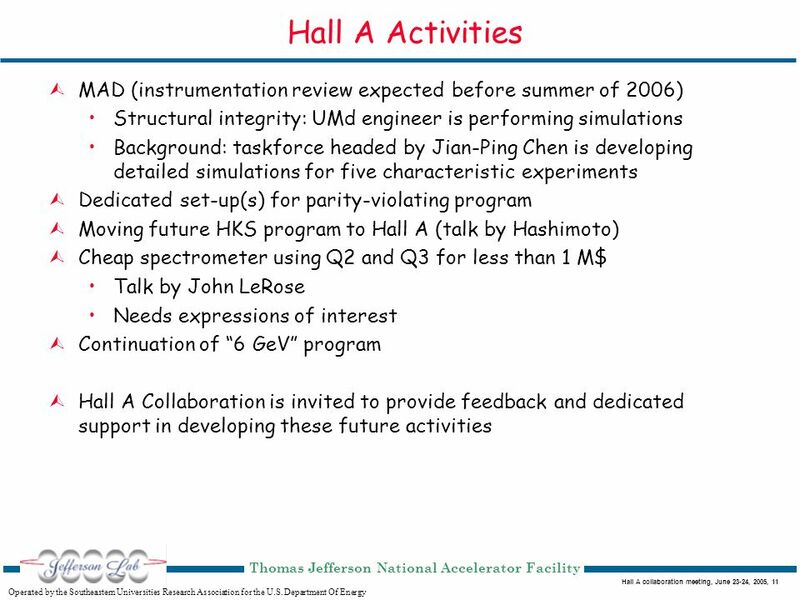 Hall A collaboration meeting, January 4-5, 2007, 1 Operated by the Jefferson Science Associates for the U.S. Department Of Energy Thomas Jefferson National. Hall A collaboration meeting, December 5-6, 2005, 1 Operated by the Southeastern Universities Research Association for the U.S. Department Of Energy Thomas. Understanding the Three-Body Nuclear System: Asymmetry Measurements in Quasi-Elastic Ge Jin University of Virginia For the E Collaboration. Hypernuclei, – N interaction Electroproduction of hypernuclei E experiment UPDATE Experimental equipment and setup Kaon identification RICH detector. E : Spin-Duality Analysis update Patricia Solvignon Temple University, Philadelphia Hall A Collaboration Meeting, June 23-24, 2005. Hall A collaboration meeting, June 22-23, 2006, 1 Operated by the Jefferson Science Associates for the U.S. Department Of Energy Thomas Jefferson National. PR Conditionally approved Should demonstrate that the experiment can extract information from states separated by 0.35 MeV. 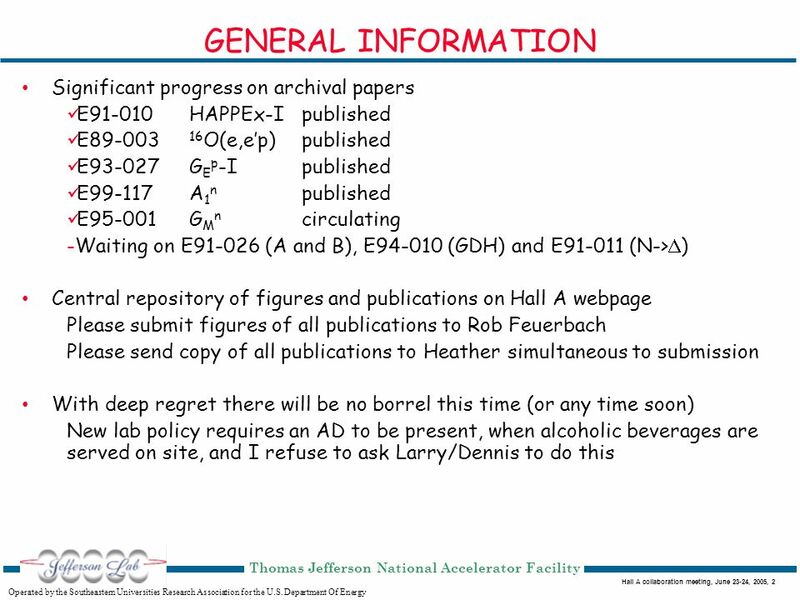 Robert J. Feuerbach Jefferson Lab Constructed from contributions from the HAPPEX Collaboration Hall A Collaboration Meeting December 5, 2005 HAPPEX-II. Hall A collaboration meeting, May 17-18, 2004, 1 Operated by the Southeastern Universities Research Association for the U.S. Department Of Energy Thomas. 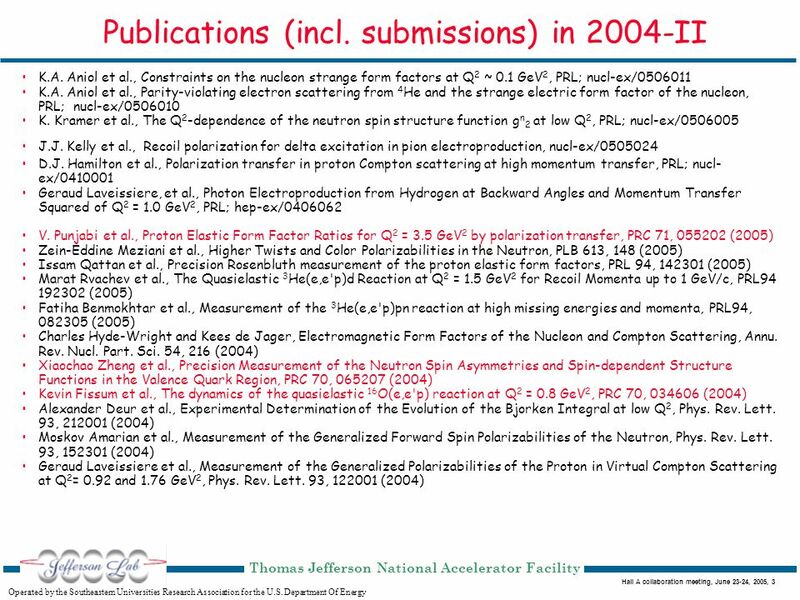 Study Neutron Spin Structure with a Solenoid Jian-ping Chen, Jefferson Lab Hall A Collaboration Meeting June 22-23, 2006 Inclusive DIS: Valence quark spin. 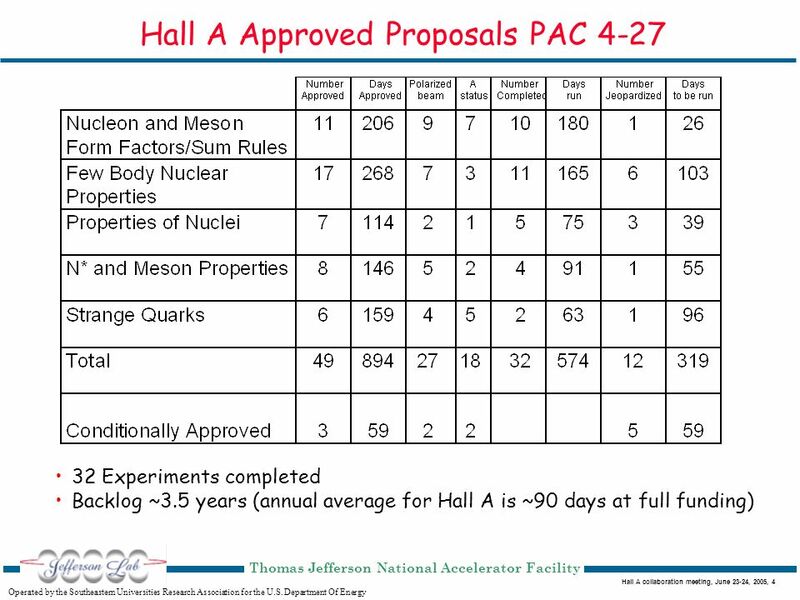 Hall A collaboration meeting, Junr 21-22, 2007, 1 Operated by the Jefferson Science Associates for the U.S. Department Of Energy Thomas Jefferson National. Deeply Virtual Compton Scattering on the neutron Slides by Malek MAZOUZ June 21 st 2007 Physics case n-DVCS experimental setup Analysis method Results. GEn_stat_12-05 Hall A Collaboration Meeting December 5-6, 2005 Status Report: G En G. Cates, K. McCormick, B. Reitz, and B. Wojtsekhowski; spokespersons. 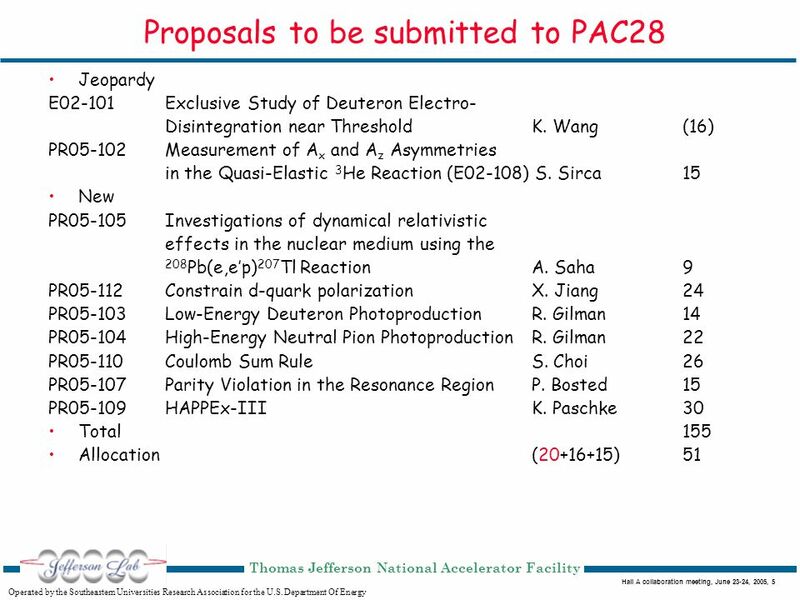 E05-102: Measurement of A x and A z asymmetries in the quasi-elastic 3 He(e,e'd) reaction Hall A Collaboration Meeting Xiaohui Zhan MIT prsented by Measurement. Measuring the Spin Structure of 3 He and the Neutron at Low Q 2 Timothy Holmstrom College of William and Mary For the Jefferson Lab Hall A Collaboration.